Achilles sprays Ajax into the enemy's eyes, and triumphs, victorious! A semi-mythical hero of Ancient Greece who fought against Troy in the infamously famous Trojan War, reputedly over Helen of Troy whose face is said to have launched a thousand ships. (Historical evidence does not state in which direction the ships were launched; whether away from her in utter panic at the sight or towards her in a brave attempt to destroy The Face, which had been blighting all the crops in the Mediterranean and causing all livestock to give birth orally to fluorescent pink young.) Achilles was also famously in possession of a dodgy heel, so named the Achilles Heel after him since no one else in history was lucky enough to also be in possession of and attached to the said heel apart from Achilles himself. Primary historical evidence does not relate whether it was his left heel or right heel which was his Achilles Heel. Historians speculate that he may have deliberately concealed this information to reduce the risk of fatalistic death by pointy Arrow, pointy Axe or pointy little Stick attack to the heel in question. A theory has also been expounded that both heels were his Achilles Heel (the plural of the term does not exist despite his having two heels) but he selfishly refused to reveal this information, hoping to confuse all potential attackers with the bewildering 50/50 risk of choosing the wrong heel and finding a very alive and very angry Achilles attached to it. Achilles at home, trying to strengthen his heels. According to myth, Achilles' mother Thetis was a sea nymph, and therefore immortal. His father Peleus, however, was not immortal, which meant that any of Thetis' children would be only semi-divine and therefore wholly susceptible to pain, mortality and general fatalistic death. Thetis was understandably not very pleased with that and proceeded to attempt a 'Make My Children Immortal' campaign. This involved shoving her children into fires, dunking them in boiling tar, dropping them down dangerous rapids and lightly broiling them in casserole dishes with diced onions and lots of oil. However, Achilles was saved from this tasty fate by his father who managed to stop Thetis from charbroiling his last son. In disgust, Thetis tried the next best option- dipping Achilles into the River Styx, which would make him invulnerable to all axes, arrows and painful Spiky Yellow Sticks like f**** korean guy in Cs and starcraft. However she held on to his ankle to do so and as a result, Achilles' Heel was left untouched. Thus his dodgy heel. No one knows why Thetis forgot, or why she didn't just dip him in holding one heel and then hold the other one so the first heel could get a dunking. But it can be assumed she certainly kicked herself after Achilles was subsequently killed to death by means of said heel being penetrated with a poisoned arrow during the filming of the epic movie 'Troy'. 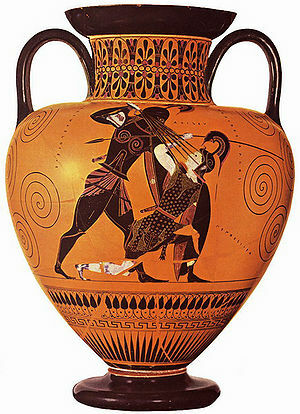 According to several notable historians, Achilles reputedly got his name from his incredible fighting ability and his love for war. When he was in his first battle, he shouted, "I kill 'ese guys, and I kill 'ese guys, and I kill anything that moves!" Those that heard him began to call him "I kill 'ese", which was then modified to "Achilles". Other theories abound, mainly under the argument that Thetis would have named him "Achilles" first seeing she couldn't have called him 'My Diddums Widdle Ray of Sunshine' and 'Liddle Lambie-Pie' forever. However, several notable historians also maintain that before Achilles was named such, his given name was Algernon Eustace Stanhope Fitzgerald. The First. Junior. This of course could explain Achilles' love for war- it is statistically proven that anyone saddled with a name like that will either die before conception from the shame of it or will develop a violent hatred for anyone who calls them by said name. 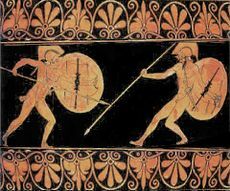 Achilles and Patroclus liked to work out with shields and helmets before lunch. In the epic movie 'Troy', a certain young man by the name of Patroclus is also included with Achilles. In said movie, Patroclus is Achilles' cousin and dearly loved by him. That is all. And so it is according to myth. According to myth, Patroclus was nothing but Achilles' cousin once removed. His relationship with Achilles was totally platonic and had absolutely no hint of anything particularly dodgy about it. There was absolutely nothing going on between Achilles and Patroclus. It is not at all significant that they shared the same tent. It is also not even slightly significant that Achilles went quite ballistic when he heard of Patroclus' death. It is not even slightly, slightly significant that Homer's epic poem 'The Iliad' and various other myths say otherwise. Very evidently, Patroclus did not have a 'special relationship' with Achilles'. In fact, to state it as clearly as possible, Patroclus was most certainly not Achilles' catamite. Not at all, do you hear me? Not at all. (At all.) Nope. No siree, nothing going between those two. However, Recent archaeological evidence revealed that Patroclus was still living in a retirement home in Croydon, and his death at the hands of Hector was all an elaborate plan to escape the war, and Achilles, so he could marry his life long girlfriend, Fredomedes. When questioned, Patoclus revealed that Achilles did indeed attempt to engage in "Relations" with him, but refused to comment on wether these advances where ever accepted. However, Fredomedes did indeed tell us that His own relations with Patroclus were made easier by a past lover (of Patroclus) lasting legacy. What this is, Archaeologists were not prepared to find out. So to the modern world, Patroclus remains an acceptionally adept figure of manhood, handsome, muscular, but DEFINITELY not gay. A discrepancy between the film and movie, however, is the familial relation of Patroclus and Achilles. According to the Iliad, Achilles and Patroclus were related on their respective paternal sides: Aegina was Patroclus' paternal grandmother, and Achilles' great-grandmother. This made them cousins once-removed. However, according to the film version, they were just cousins. But don't let that bother you; the movie was very historically accurate. Don't listen to those whiny classicists bitching about the movie butchering the Iliad. They're just jealous and butthurt. In 'Troy', Achilles' love-interest is a girl named Briseis; a Trojan priestess of Apollo and a Princess of Troy. Mythologically, however, the character of Briseis was comprised of three people- of Cassandra, a priestess of Athena and Princess of Troy; of Chryseis, a priestess of Apollo outfitted with a demanding father; of Briseis, a totally random Trojan girl; and of a reincarnation of Wonder Woman, complete with fluffy pink tiara and sparkly purple magic wand. Not much happened to Briseis mythologically except for the fact that Achilles threw a tantrum when she was taken away from him and refused to fight, sulking in the corner of his tent for days (comforted by Patroclus. In a totally platonic way). Otherwise, the Briseis of 'Troy' the Movie is far more interesting. This page was last edited on 9 October 2012, at 01:15.